The DCA photo contest is underway. The theme is the people, places, and events of our neighbourhood. The contest isn't just for pros, anyone who can snap shots with a digital camera can enter. Read more about the contest here. 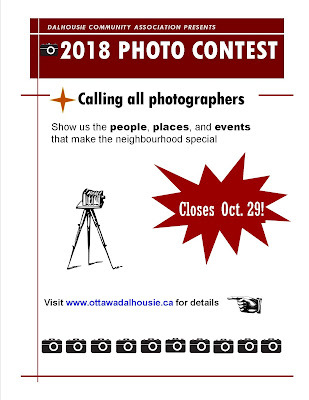 If you've got your photos ready submit them here. Not sure what to photograph? Why not come out for Market Day at the community garden on October 14. Find information on the event's Facebook page. After a hot summer, the DCA is back to regular meetings. In development news, DCA members have voted to appeal the decision to approve the developer’s application for 900 Albert. City council approved the application in July, completely ignoring the secondary plan formulated by city staff, landowners and the community. The plan stated a maximum height of 30 storeys, whereas the approved application includes a 65 storey building. In preparation for the LRT, OC Transpo is changing bus routes, with several changes directly affecting Dalhousie. As of September 2, the #11 no longer stops on Rideau Street in front of the Rideau Centre, cutting passengers off from the shopping mall and ByWard Market. Route #4 remains the same but the number changes to #10. When the LRT eventually opens, the #85 will proceed north on Booth to Gatineau and Route #16 will be modified to connect with the new Parliament station. Route #14 remains the same. Our Dalhousie neighbourhood features many examples of historical architecture. A gallery of over 200 photos showcasing properties of heritage value in the Dalhousie neighbourhood is now up for viewing. Many of these properties have been added to the Heritage Reference List thanks to the recommendations of the DCA. Read more and see the full gallery here.